The many theatres in West Bengal can be broadly divided into Kolkata-based theatres and rural theatres. Outside Bengali-speaking areas, the term "Bengali theatre" primarily refers to Kolkata-based groups, as the rural theatres are less well-known. There are also Bengali folk theatres. There are many dialects of Bengali spoken in West Bengal and Bangladesh. The larger Bengali theatres use the dialect spoken in Kolkata, Bengali folk theatres have performances in some of the other Bengali dialects. There is another category of Bengali theatre called Jatra, which is run commercially in rural West Bengal and Bangladesh. The most prominent characteristics of Jatra are over-acting and extensive use of traditional musical instruments. Many popular Bengali film artists participate in Jatra. Bengali theatre has its origins in British rule. It began as private entertainment in the early 19th century.In the pre-independence period, Bengali theatres played a pivotal role in manifesting dislike of the British Raj. After the independence of India in 1947, leftist movements in West Bengal used theatre as a propaganda tool. This added some unique characteristics to the art form that still have strong effects. 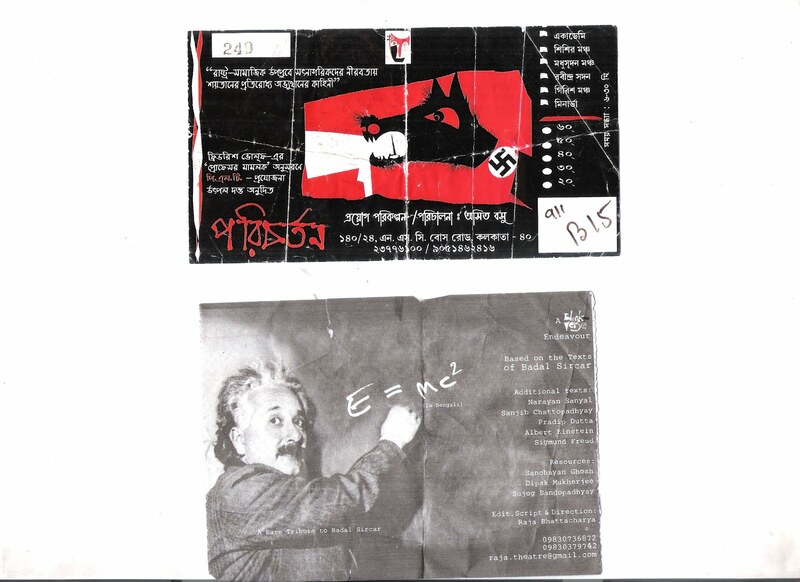 These groups differentiate themselves ideologically from commercial Bengali theatre. West Bengal's capital Kolkata—as the former capital of India—was the birthplace of modern Indian literary and artistic thought, and is referred to as the "cultural capital of India".The presence of paras, which are neighbourhoods that possess a strong sense of community, is characteristic of West Bengal. Typically, each para has its own community club and, on occasion, a playing field. Residents engage in addas, or leisurely chats, that often take the form of freestyle intellectual conversation. West Bengal has a long tradition of popular literature, music and drama. Kolkata is the birth place of modern Indian Theatre. Under British colonial rule, modern Indian theatre began when a theatre was started in Belgachia, Kolkata. Rabindranath Tagore, who was awarded the Nobel Prize for Literature in 1913, is probably India's best-known modern playwright.His plays are written in Bengali and include Chitra (Chitrangada, 1892), The King of the Dark Chamber (Raja, 1910), The Post Office (Dakghar, 1913), and Red Oleander (Raktakarabi, 1924. I have seen numerous Theatres in Delhi and Kolkata. I will slowly list the ones I have enjoyed gradually.It will take some time! I am little biased towards Utpal Datta. Today I saw Ja nei Bharate by Manoj Mitra based on story of Mahabharat at Tapan Theatre. Manoj Mitra has acted wonderfully in it. It basically tells you about the story of Mahabharat before the Kurukshetra war. It tells you about the manipulations made by the different characters of the epic, which is not very well known. I would strongly recommend you to see Utpal Dutta's Kirat Parba after this theatre. Kirat Parba (talks you about the manipulations in the Kurukshetra war) is undoubtedly one of the best thatres i have ever seen. I saw two interesting theatres in 2011 - first one is "Paribartan" - translated by Utpal Datta , PLT, it is on Professor Mamlock, a successful and respected Jewish surgeon, does his best to ignore the political crisis of the Weimar Republic. He is greatly troubled by the political tendencies of his son, Rolf, a passionate communist who is determined to resist the strengthening Nazi Party by all means. When the Nazis seize power and brutally crush all opposition, Mamlock is forced to leave his clinic for Jews are no longer allowed to practice medicine. He is dragged through the streets by SA men who emblazon his doctor's robe with the word "Jew". Mamlock, broken and humiliated, attempts suicide but fails. As he recovers, he hears an SA rally outside the hospital. He carries a speech calling on the people to resist, having finally realized that his political apathy was a mistake. The SA shoot him dead. Rolf, who escaped a deportation to a concentration camp, becomes leader of a new resistance movement . The theatre is worth watching. Digging into the past, Sarat Chowdhury, an ``insane`` professor unearths information on the handling of nuclear energy. `E=mc2 , Einstein`s revolutionary formula had shaken the world in the first half of the 20th century and paved the way for a new world, perhaps braver but much more ruthless. The atomic bombing of Hiroshima and Nagasaki in 1945 revealed just how lethal such knowledge, especially when used against an unsuspecting population, can be. The play depicts the imaginary trial of representatives of the human race – scientists, professors, doctors, engineers, politicians and military personnel on the one hand, and the charred, bereaved, traumatized victims of the bombing, on the other. As the trial proceeds, terrible truths are reveled, and Sharat`s thirst for justice –for the individual as well as for the entire human race – grows stronger. Terrified about the potential radioactive fallout that might be unleashed on the world and through his emotionally effected state, he manages to reach what he believes to be the root of the malady. Although first half was unremarkable, second half was really remarkable. the only problem I faced is understanding the name of people (Westerners) - due to bad pronunciation. Today I saw a theatre at EZCC - "Meyeti" by Lok Krishti (direction by Kishore Sen gupta). It is based on story of Eriel Dorfman. I really liked it and bought a VCD. Interestingly I saw the theatre in 2009 at Sujata Sadan,Hazra, based on same story, but by a different theatre group! Today (16.04.2011. 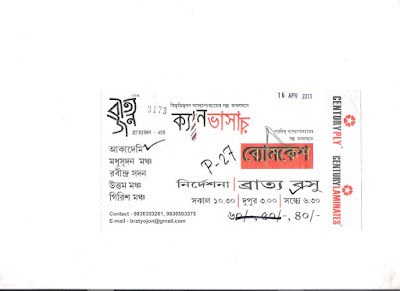 ), we saw the theatre at Academy directed by Bratya Basu. As usual it was of high quality as expected from Bratya Basu. It was a murder mystery by Sardindu Bandopadhyay where suspect was the family members. The music was good and role played by the detective was of very high quality.